BRICK Award-winner Ashley Rhodes-Courter lived in America's foster care system for 10 years. After living in 14 different foster homes before finally being adopted at the age of 12, most kids would count themselves lucky to finally find a permanent home and leave the foster care system behind them. But Ashley doesn't want to leave the system behind; she wants to fix it. Ashley has since dedicated her life to working to better the lives of adoptable children everywhere. Her goal is to ensure that the more than 118,000 children waiting for placement become more than just another sad statistic. She has spoken to thousands of people, sharing her story— of the revolving door of foster care, of abuse, of separation, of neglect— and raising awareness. She also helped raise over a million dollars for the Dave Thomas Foundation for Adoption, and she has helped countless other people by making the facts of the adoption system in America known. She has won numerous honors for her work, and in 2004, she was named Youth Advocate of the Year by the North American Council on Adoption. At the age of 21, her tireless work toward changing the hearts and minds of Americans with regard to the foster care system earned her a 2007 Golden BRICK Award in the category of Education & Environment. But for Ashley, the awards are secondary; it is the goal that matters. She made it out of the system with a bright future, and she sees no reason why every other child in the system shouldn't have the opportunity to do the same. We recently had a chance to sit down with Ashley and ask her about her experiences in the foster care system, her work as an advocate for adoptable children, and the plight of those still caught in foster care. HowStuffWorks: What inspired you to get involved and become an advocate for adoptable children? Ashley Rhodes-Courter: I spent 10 years in the foster care system. I had 14 different placements before being adopted at the age of 12. Many of them were very abusive, and later we found out that 25 percent of my foster parents became convicted felons. So I kind of had the experiences that you read about in the newspaper, the horror stories. When I was adopted at the age of 12, I was so mad, and so guilty at the same time for leaving all of my friends, and all the kids who had once been my brothers and sisters. My adoptive parents are amazing people. My adoptive mother is a best-selling novelist, my father's a documentary film-maker. And they were working on a film that highlighted all of the different techniques that were being used in the United States to find children permanency. I auditioned for the film and I got cast. And I used my story to help illustrate how all of these different techniques, had they been used in my case, how my life would have turned out differently. That video was distributed, more than 10,000 copies, all around the United States. And from that, the National CASA, which are court appointed special advocates, or guardian ad litems in some states, asked me to speak at their national conference when I was 14. So that was my first big kind of motivational speech. Since then I've spoken personally to over 15,000 people and shared my story with them. HowStuffWorks: How does sharing your story change things? Ashley Rhodes-Courter: My main goal is to try to change the minds of Americans and get rid of all these pre-conceived notions that foster children have. You know, all of our lives we're told that we're useless and that we're never going to go anywhere and we're never going to do anything. I want Americans to open up their hearts and open up their homes to these 118,000 adoptive children who are waiting for placements. The system is so overrun, that… I mean there are [500,000] children in foster care in America, 30,000 of which age out of the system with no prospects, no homes, and often no chance. So my goal is to make sure that each child has a fighting chance of finding a permanent, loving family, like I did. HowStuffWorks: It sounds like a big challenge is that a lot of these children are, as you've called them, hard-to-place kids. Ashley Rhodes-Courter: That's our title. That's what we're given. HowStuffWorks: The title refers to older adoptable children? Ashley Rhodes-Courter: Special Needs Children. When you hear special needs, automatically you think, oh, a physical disability, a mental disability. But in foster care, if you're over the age of nine, you're considered Special Needs, just because of your age. When my adoptive parents were going through their classes, their training classes, their parenting classes, they were told that they were poor candidates to be adoptive parents because they had an older son who went to Princeton, because they had high-profile careers, because they had this big, beautiful home. And they (the trainers) said, "No, no, you're never going to find one of these foster kids that's college-bound. None of these little foster kids are going to live up to your expectations." And this is what the trainers are telling people! I mean it's just disgusting to me that people think that foster youth are just doomed to be these negative statistics that are out there and that's just not the case. HowStuffWorks: How do you convince people to change the stereotype? Ashley Rhodes-Courter: By sharing my story. Because there's so much bureaucracy, and so much red tape around these stories. And so many confidentialities. You know confidentialities can often hurt children more than protect them. The State's really careful about not letting these stories leak, and not wanting these kids to talk, and making sure everything's rainbows and sunshine. HowStuffWorks: But the truth is, these are children, and every story is unique. Ashley Rhodes-Courter: When I was getting my make-up done, the make-up artist shared with me that she had been in a foster home. She told me she had never told anybody that because she was ashamed of it. And I said don't be ashamed of it, be proud of it. People are touched by adoption, or kinship care, or foster care in so many ways. So to bring more media, more attention to this in a positive respect can literally change America. Because we're talking about America's youth. And, you know, American foster kids don't have glasses, don't have medical care. People don't have to go overseas to see third-world conditions because I lived them in foster care, in a system funded by America's government. HowStuffWorks: You have speaking engagements across the country. Do you sense a change in people from when you enter a room to after you've spoken? Ashley Rhodes-Courter: Absolutely. I spoke at a CASA convention in Texas, and afterwards a woman came up to me with her resignation papers in hand and she ripped them up. She said "Thank you. You reminded me of why I'm doing this. Why I'm fighting so hard." I once gave a speech at the International Wendy's convention. And this was a speech to a bunch of franchise owners, and people who give products to Wendy's. I was there for the Dave Thomas Foundation for Adoption. And to be honest a lot of these guys were, like, the big beef cattle guys, who don't necessarily care about kids or adoption or whatever. But after that speech, I brought these big burly beef men to tears, and I helped generate one million dollars for their fundraiser. HowStuffWorks: Aside from the Wendy's convention, what's one thing that you've experienced while working on this that made you feel like you were making a difference? Ashley Rhodes-Courter: I think it's the letters that I get. Being an advocate, you don't see immediate results, especially when you talk to youth. Because they're not going to come up to you. But later, I'll get letters saying "I've been sober for a year, and I've been volunteering in my community because of you. Thank you." I'll get a phone call from an adoptive parent saying "You know what? This is never something we thought we would do, but because of you, we adopted a sibling group of four." It's the impact that I get. Some of the work I've done helped change legislation for the 1997 Adoption and Safe Families Act. I'm just doing what I can to make a difference and make an impact. When I was younger, I did a lot of advocacy. But now that I'm older, I'm realizing, "Oh! I can get into politics. When I'm 25 I can run for office." So I feel like I have the potential to influence political change that will help. HowStuffWorks: Are you considering running for office? Ashley Rhodes-Courter: I went around with a congressional delegation visiting various foster care and adoption sites in Florida. And I was kinda there as a bluff-caller. There was a panel of judges that said, "Our adoptions have tripled and we don't have kids that get sent back." And I said, "Well, I've seen first-hand that that's not true." Right now, I'm just laying the foundations for a lot of different options. Either way, these issues are something I'm gonna talk about, speak about, write about. Because it's who I am, it's where I came from. I will embrace other titles in my life -- I want to be a mother, I want to be a scholar, I want to be all these things -- I won't always be Little Orphan Ashley. But again, it's where I came from. So it's my job to try to make it better. 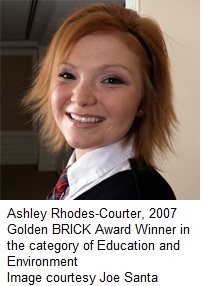 "2007 BRICK Award Winner: Ashley Rhodes-Courter" 17 February 2007. HowStuffWorks.com. <http://money.howstuffworks.com/do-something-brick-awards-winner-ashley-rhodes-courter.htm> 07 February 2012.